Though the long-delayed presidential election process in the Maldives often seemed in danger of never coming to a completion, today’s Maldivian runoff has apparently selected a new president — five days after the Maldivian constitution required an inauguration and a week after the first round of the rescheduled vote. Former president Mohammed Nasheed won nearly 47% of the vote in the first round — and around 45.5% in the previous first round held in September (which was subsequently annulled by the Maldivian supreme court). But last week’s runner-up Abdulla Yameen (pictured above) emerged victorious today in the runoff, boosting his support from around 30% in the first round to 51.39% today. Nasheed won just 48.61%. Nasheed became the first democratically elected president in Maldivian history when he won the previous 2008 presidential election, though he was pushed out of office in February 2012 following protests over rising prices and a poor economy. Nasheed achieved international fame for the cause of climate change — at an average of around four feet above sea level, the Maldives face destruction from global warming and rising sea levels. But those concerns were distant from the 2013 election and political crisis. Yameen’s electoral win is a victory for Maumoon Abdul Gayoom, who ruled the Maldives from 1978 to 2008 (Nasheed defeated Gayoom in the 2008 election). Gayoom, however, never fully left the stage of Maldivian politics — Yameen is his half-brother, and many of the Maldivian state institutions, especially its judiciary, are believed to remain more loyal to Gayoom than to the rule of law. Though the Indian and global media are reporting that Yameen’s victory is somewhat of a surprise, it shouldn’t be. Nasheed failed, however narrowly, to surpass the critical 50% mark in both the annulled September 7 round and in the November 9 round. Moreover, the third-place candidate, Qasim Ibrahim, a former Gayoom-era finance minister, won 23% in the previous vote, and he subsequently endorsed Yameen. It was Ibrahim’s complaint about potential ballot fraud following the first round that led the Maldivian supreme court to annul the September vote, a move that was widely seen as an opportunity for Nasheed’s opponents to unite around Yameen. It’s clear that after three votes, Nasheed marshals something just short of an absolute majority (45.45%, 46.93%, 48.61%) of the Maldivian electorate. While the process may not have been comically flawed, the votes demonstrate that Nasheed simply failed to build a fully majoritarian coalition for his relatively secular, technocratic, pro-democracy, pro-development vision. It’s important to remember that five years ago, when Nasheed capitalized on three decades of pent-up resentments over the Gayoom regime, he defeated the old authoritarian with just 53.65% of the vote. While Nasheed has conceded defeat in today’s vote, in a move to reinforce respect for the country’s nascent democratic institutions, Gayoom’s resurgence leaves those fragile institutions somewhat in doubt. Yameen, the candidate of the Progressive Party of Maldives (PPM), a party that Gayoom founded in 2011, campaigned on harsh criminal penalties — including the death penalty. 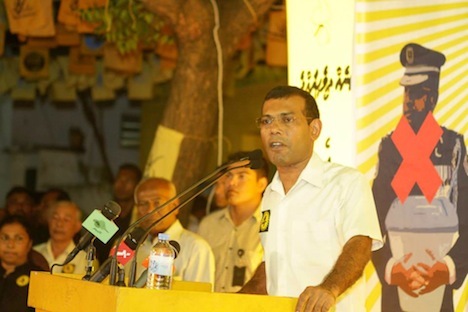 Nasheed had campaigned on a more broadly economic platform of boosting tourism revenues and business development. Perhaps more fundamentally, Yameen and Ibrahim accused Nasheed and the Maldivian Democratic Party of being too close to the West and too secular in the Muslim country of just 328,000 residents. Nasheed, in turn, argued that Yameen was using religion as a wedge issue to stir resentment and allow for Islamism to take root. After all of the drama of the past two months, a re-run of the Maldivian presidential election essentially returned the same result as the original September 7 election. 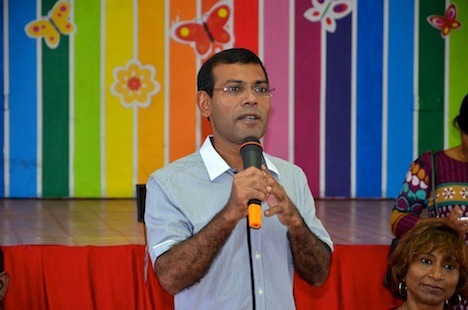 Just as in September, the winner of the November 9 election was Mohammed Nasheed, who won the first free presidential election in Maldivian history in 2008, but who was also subsequently pushed out of power in February 2012 by the country’s police and armed forces following massive protests over rising prices. Nasheed won 46.93% of the vote, a slight increase over the 45.45% he won in the first round, but not enough to achieve the absolute majority that would avoid a runoff with the second-place candidate. That would be Abdulla Yameen, who is the brother-in-law of Maumoon Abdul Gayoom, who served as the president of the Maldives between 1978 and 2008, and who still wields significant influence throughout the country and throughout various Maldivian institutions. Yameen won 29.72% in the weekend vote, an increase over the 25.32% he won in September. As in September, Gasin Ibrahim, a businessman and former finance minister in the Gayoom era, finished in third place. But a complaint from Ibrahim over the first election caused the Maldivian supreme court to annul the results of the September election and cancel the planned runoff, despite general approval from global election monitors that the vote was largely conducted on a free and fair basis. Scheduled originally for October and postponed until November 9, Nasheed (pictured above) and his supporters hoped that in a re-run he could win over 50% of the vote, thereby definitively returning him to the presidency. But that didn’t happen, and the Maldivian supreme court has now postponed the runoff once again, despite the fact that it was supposed to be held on Sunday. The problem with that delay is that a new president is supposed to be inaugurated today — the term of Mohammed Waheed, Nasheed’s former vice president, who assumed the presidency in February 2012, ends today, November 11. That means that the Maldives will wake up tomorrow in something of a constitutional crisis — with no president, an uncertain and tentative November 16 runoff, and no fixed date for the next presidential inauguration. That, in turn, could lead to more judicial delay or even a military intervention, both of which would be bad news for Nasheed and for Maldivian democracy, because forces loyal to Gayoom still essentially control the military and the judiciary. There’s a chance that the runoff will be held later this week, Nasheed and/or Yameen win a clear victory, and the Maldives marks a clean transfer of power to the eventual victor. But everything about the troubled path to Saturday’s presidential vote indicates that the path back to Maldivian democracy and the rule of law won’t be quite so easy. Maldives electoral officials have set new dates for a presidential poll amid a growing row over the delayed vote. The first round of the elections will now be held on 9 November, and a run-off – if required – on 16 November. 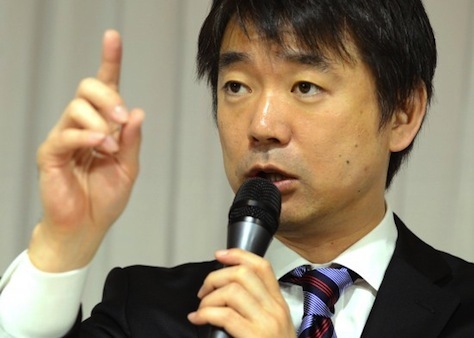 The first round of voting, in September, was annulled by a court, and on Saturday police blocked an attempted re-run. Meanwhile President Mohamed Waheed told the BBC that the polls would be free and fair. The Maldivian supreme court’s initial cancellation of the planned September 28 runoff was cause enough for alarm, but its decision to annul the original September 7 results and hold a new election on October 19 was even more discouraging. Mohamed Nasheed, who won the country’s first democratic elections in 2008, was pressured to step down from office in early 2012 amid protests over the economy. He won over 45% of the vote in the initial September election, and was set to face Abdulla Yameen,the half-brother of Maumoon Abdul Gayoom, who led the Maldives with an authoritarian government between 1978 and 2008 and whose influence continues to threaten the country’s turn to democracy. Needless to say, it’s becoming increasingly clear that Gayoom (pictured above) and his allies in the Maldivian courts are trying to prevent Nasheed from taking power again. Nasheed, after the latest postponement, called on Waheed to resign — Waheed, his former vice president, assumed the presidency upon Nasheed’s resignation in February 2012. Under the constitution, the Maldives must have a president on November 11, so it’s unclear what will happen if no candidate wins more than 50% of the vote. At this point, it would not be surprising to see Maldivian authorities find a way to shut Nasheed out from the election. After halting a runoff in the Maldives at the last minute, the Maldivian supreme court has now annulled the results of the first round of the election on September 7, calling a new election that’s supposed to be held October 19, with a potential runoff on November 4. Thousands of Nasheed Maldivian Democratic Party (MDP) supporters cautiously welcomed the Supreme Court announcement of the date of the polls. “Do not worry. Now we have the election in our hands. We wanted an election date. 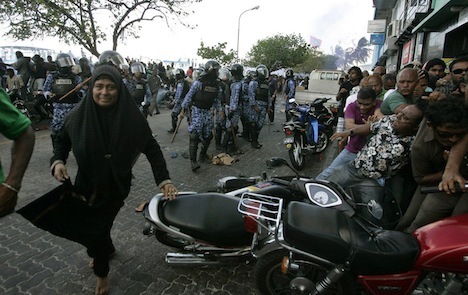 Now we will not even have to go for a second round,” MDP legislator Mohamed Nazim told a gathering outside the court. Nasheed’s supporters have taken to the streets since the initial September 28 runoff was cancelled. 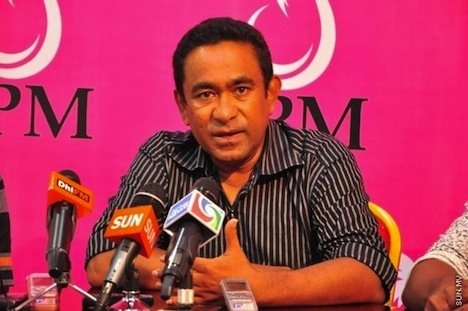 The former president, who was pressured to step down in 2012, won over 45% of the vote in the initial September 7 election, and was set to face Abdulla Yameen, the candidate of the Progressive Party of Maldives, and the half-brother of Maumoon Abdul Gayoom, who ruled the Maldives between 1978 and 2008, when he lost the country’s first democratic election to Nasheed. But no one really knows if the October 19 vote will actually take place given the shenanigans that have already occurred (more Suffragio background here). It’s not rare to see a fraudulent election denounced by international observers upheld by a country’s judicial system, but it’s odd to see a perfectly free and fair election, conducted with praise from international observers, vacated by the highest court in the land. The Supreme Court petition filed today (October 10) states as grounds for stripping Nasheed’s candidacy his “outright criticism towards Islam and imposing Islamic Sharia’ in the Maldives” and his criticism of the judiciary. Stay tuned. Something tells me this won’t end well. Will the Maldives pull itself together to hold a free and fair presidential election? The Maldives was supposed to hold an election last Saturday — a presidential runoff that may have resulted in the return of Mohamed Nasheed (pictured above) to power. Instead, the runoff was cancelled by the country’s supreme court over allegations of fraud in the first round, setting off protests and scrambles in the island nation of around 340,000 people in the Indian Ocean just southwest of India. Although the electoral commission ultimately backed down from its initial plan to proceed with the September 28 runoff notwithstanding the court order, it leaves the developing country’s nascent democratic institutions in limbo pending a planned November 11 inauguration for a yet-to-be-determined president. It’s been a rough go for Maldivian democracy in the five short years since its first free and open presidential election — an election that Nasheed won before he was removed from power in February 2012 by opponents armed by the country’s police and armed forces. Protests against Nasheed’s administration began in 2011 over the country’s poor economy due to rising prices for an island nation that imports much of its food and energy — GDP growth dropped from around 7% in 2010 and 2011 to just 3.4% last year. Nasheed, who leads the Maldivian Democratic Party, nearly won the first round with 45.45% of the vote. His opponent in the runoff is Abdulla Yameen, the candidate of the Progressive Party of Maldives, and who narrowly defeated the third-place candidate Gasin Ibrahim, a wealthy businessman in the tourism and media industries who leads the Jumhoory Party — Yameen took 25.35% to just 24.07% for Ibrahim. Both Yameen and Ibrahim have ties to Maumoon Abdul Gayoom, who ruled the Maldives between 1978 and 2008, when he lost the country’s first democratic election to Nasheed. With Gayoom-era appointees and cronies firmly entrenched in the judiciary, bureaucracy, police and military, the Maldives’ nascent democracy was stymied. Meanwhile, anti-democratic forces joined hands with religious conservatives and accused Nasheed of working with Jews and Christians and undermining Islam. Almost from his first day, Nasheed was at loggerheads with the judiciary. Officials in various state institutions ignored the Executive in making decisions, undermining Nasheed’s authority. Massive demonstrations against the president and the MDP were organized, plunging the archipelago in unrest and instability. Both challengers to Nasheed in the current race have ties to Gayoom, whose legacy looms over the country today — Yameen is Gayoom’s half-brother and Ibrahim served as finance minister and central bank president in the final three years of the Gayoom regime. Generally, Nasheed opposes the delay in the runoff as a violation of the Maldivian constitution amid fears that Gayoom loyalists are behind the delay, and he Nasheed called for peaceful protests on Saturday. 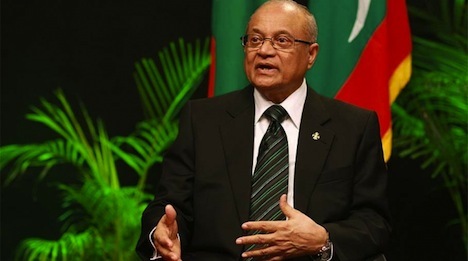 Gayoom himself has already called for the first-round results to be annulled. Although the supreme court’s ruling relates to charges from Ibrahim about fraud in the first round (though international observers found little to complain about), Ibrahim supports Yameen. So does the current president, Mohammed Waheed, who finished in last place with just over 5% in the race, and who served as Nasheed’s vice president until Nasheed was ousted from office. But it’s not clear where the runoff stands because the Maldivian supreme court didn’t bother setting a new date for the election, leading Nasheed and his supporters to believe that the court might never set a date for a runoff. In any event, it’s not clear what the delay means for Maldivian law or for Maldivian democracy. If the runoff is never held, or if the first-round results are cancelled, the Maldives will face another constitutional crisis. Even if a delayed vote is ultimately held between now and November, a Yameen victory would be tainted by allegations of rigging and bias from the country’s generally pro-Gayoom judiciary.